Due to technical difficulties any reports submitted to us during 2015 have been lost. Please re-submit any information you have offered using the usual report form which will now be directed to a new email address. 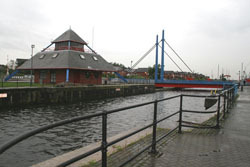 If it's a swing bridge, lift bridge, drawbridge, bascule bridge, sliding bridge, retractable bridge, curling bridge, rolling bridge, telescopic bridge, transporter bridge, counterweight bridge, boat lift or any other sort of movable bridge and is in the British Isles it belongs on this website, whether it is on a canal or river, in a dock or marina, or over the moat of a castle or fort. In time we intend to create a comprehensive historical and photographic record of movable bridges in the British Isles, with the help of supporters and contributors. 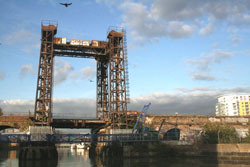 Following the addition of over 500 defensive structures during the winter of 2009-2010, and many other additions over the last year, this website now lists 2,355 locations in the British Isles where there is or has been a movable bridge. We have photographs of around 960 of these locations so far. With so many bridges to research and photograph we are increasingly reliant on visitors to the website to add to the information and to provide photographs. All help is very much apprecitated and always acknowledged. 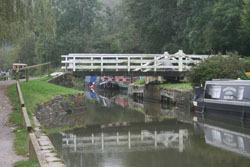 We have tried to be accurate in describing each bridge, but we hope you have a sharp eye for detail to spot any errors that we have made or to point up any gaps in our information. For a full explanation of the origins and aims of the site please read the mission statement. If you have any comments about the site please e-mail the address in the contacts page.